This is a deliciously easy watermelon treat and something you definitely want to do with your kids this summer (or for your kids). We found it after July 4th, but still had to feature it. Cut off the end of a watermelon and clean out insides in one clean swoop and one piece, to preserve the watermelon inside for star shaping. Turn the leftover shell over into a paper bowl. Snip off one pointy end of skewers. Place other pointy end in overturned watermelon top. Repeat with as many skewers as you want. Slice the rest of the watermelon so that cookie cutters will cut out some nice stars. In other words, not too thick (about an inch thick). Cut out stars. 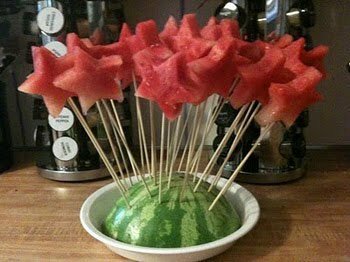 With your supervision, have your children gently push watermelon stars down on top of the skewer. 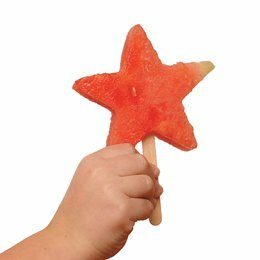 Put any left over stars in refrigerator for later. And, Viola, a beautiful craft and delicious treat, all in one. Yum! If your children are really young and the skewer idea is a little scary, use popsicle sticks. Just stick them into the watermelon and freeze. Don’t forget the display stand from the above, it makes it so much cuter. These are a great idea! I think I will have to bring these to our 4th of July picnic the family has every year. My kids love watermelon and I bet they will really enjoy these.